Experience the beach at your feet like no other place on the coast!!! The "Majestic Dream" home is possibly the "most luxurious home" on the beach and could easily be on the cover of numerous home magazines. Majestic is a new, two-story home that is open, spacious with a reverse living design (main living and kitchen are on the upper floor). The floor-to-ceiling windows offer a full view of the magnificent Oregon Coast. If you truly want it all, "Majestic Dream" is for you!!! Majestic Dream is a 4-plus-bedroom, 4-bath, two-kitchen home which is designed into two units. Both units are available together for your family to enjoy, or for a second family member or friend who want a private area. An inside door can be used for privacy or passage. The upstairs unit features full views from the master bedroom, living room, dining area, kitchen, and outside deck. A gas fireplace is located in the dining/living area. A gourmet kitchen with restaurant-style equipment, large SubZero refrigerator, separate salad sink, and granite countertop is perfect for fine dining or simply tasting wine. This unit also has a second bedroom with a king bed, full bath, and laundry facilities. The lower unit has a full view from the kitchen, dining, and living areas. A gas fireplace is located in the living area. The bedroom has a king-size bed, and the full bath is located next to the bedroom. The lower floor has a 4th bedroom with a triple bunk on one side of the room (Full bed on bottoom, twin bed on top, with a pull out twin bed under the full bed). Then there is a twin bed on the opposite side of the room. This room sleeps 6. A full bath is located just a few steps away from this bedroom. Both units have access directly to the beach and the lower deck. The hot tub is located on the lower deck with a full ocean view. This home is located directly on the beach. It is great to be able to run out the front door and down to the ocean without rocks, roads, or any other obstruction. The home is located along a street where there are no hotels or multi family dwellings causing heavy traffic or crowds. This results in a very "private" beach area. The pictures of the home really don't do it justice. To sit in the living room and look out the full length windows provides a view that very few homes have. The 2 living areas provide a separate space that is great for privacy. This could be for another family, elderly parents, or in my case, a place for my boys to go and play games while the adults make dinner, or just relax and read. The lower living area can be closed off by interior doors which really makes it private. Directly in front of the home is the largest sand box you will find. It is perfect for small children who need supervision but want to play directly in the sand. Very hard to describe the incredible view from the main living room. 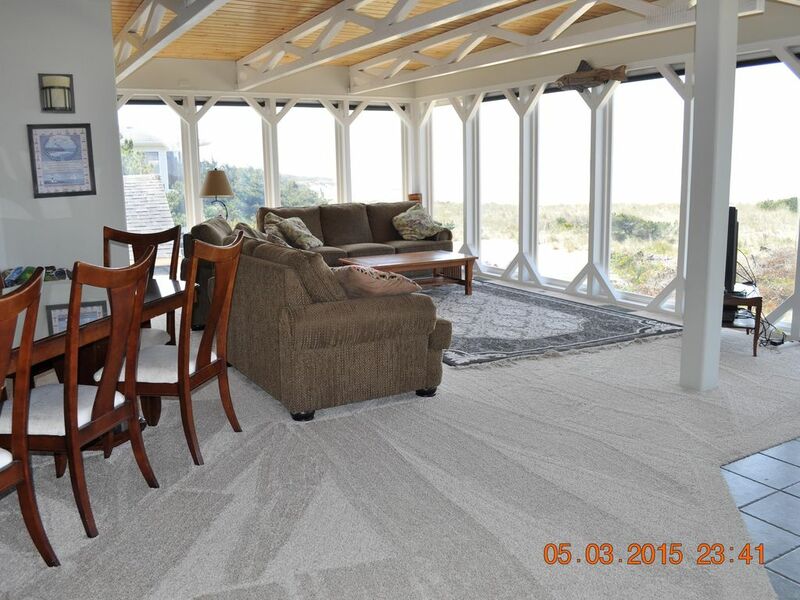 The floor to ceiling windows provide more than a view, but more of a feeling of being close to the sand and sea. This home is directly on the beach. Sand under your toes from the moment you leave the deck all the way to the ocean. Very few homes like this. We had a wonderful, long birthday weekend. We really appreciated all the sand toys, the private little beach in the back yard, the pack and play and high chair. The view is great and the location was perfect. The couch upstairs could be replaced, we could feel the springs coming through, but other than that it was a terrific place to stay. As others have said, the pics do not do this house justice. it is clean, spacious and lovely, with incredible views and a great kitchen. We would absolutely rent again. Beautiful spot regardless of the weather. We had an amazing stay here for 2 nights and 3 days. The kids loved the toys in the back and the adults were able to enjoy the hot tub while watching them . The beach access is perfect and the sunrises and sunsets were spectacular . I will definitely plan on returning when we are in the area again. A group of eight women met here as part of our annual get together and the house was perfect. There are plenty of beds, the kitchen was well stocked and the view was incredible. The living room was the perfect place to reconnect. I would definitely recommend it. The 16 family members out of 50 at a family reunion stayed here and enjoyed the house. The house is nice. The fireplace down stairs had to have the gas turned off because of the gas smell. A shower head fell off on one of the kids (not hurt). The location is great and beach access it wonderful. Would stay here again. Holiday rates are $400 per night. New Years, Memorial Day, Thanksgiving, Christmas, Rates subject to change until payment is made.